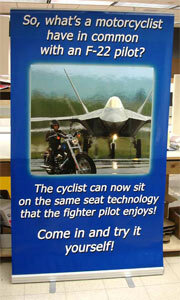 Retractable Banner Stands Deliver Impact at Tradeshows. Retractable Banner Stands deliver impact at Tradeshows, conventions, job fairs or just about any event you want recognition! Your Retractable Banner Stands could be the first thing your prospect sees. You never get a second chance to make a good first impression! So it's important your Retractable Banner Stands are designed with good color contrast, image clarity and are eye appealing. (For help designing good retractable banner stands, see How to make Good Banner Stand Graphics). Quality Retractable Banner Stands are made with Kodak Professional Display film. There are many "cheap" substrates to print on. We use the name you know and can trust when it comes to image clarity and colors that "POP!" Kodak film - the best! To see samples of our work and get design ideas for your retractable banner stands, I have a website called www.GraphicProofs.com. I use this site when a client's firewall or email server prevents them from receiving graphic proofs. Excellent color balance sets the Corazon Retractable Banner Stand as a winner! Graphics were printed on a 7 mil film and laminated with a 3 mil over laminate for added protection. Once the Retractable Banner Stands were completed, we shipped them to New York, New York and Las Vegas, Nevada. See our sale price for Retractable Banner Stands. 24 inches wide by 78 inches tall. 33.5 inches wide by 78 inches tall. 39.5 inches by 78 inches tall. 44 inches wide by 78 inches tall. 60 inches wide by 78 inches tall. Please see our "Tradeshow News and Tips" section for additional help. High resolution graphics were used for this forty eight inch retractable banner stand. For help with your Retractable Banner Stands, give me a call 1(717)379-4555. My name is Mike. I'll be happy to help out.